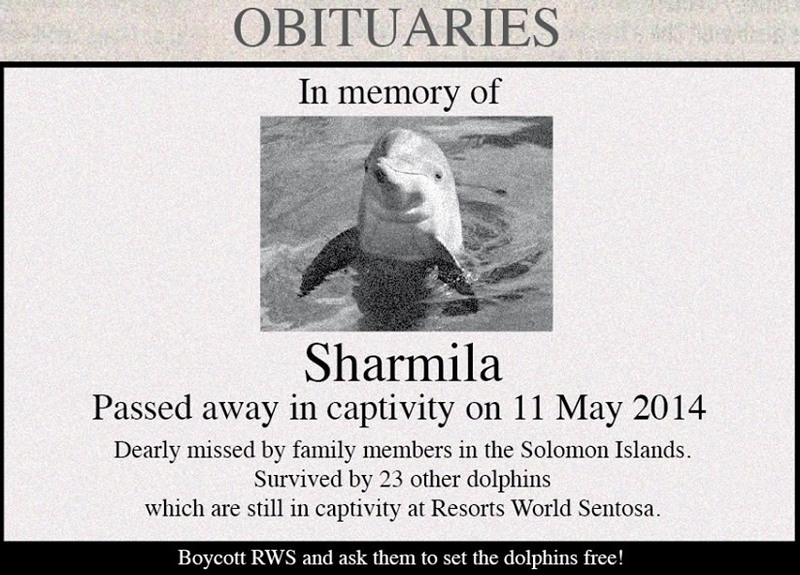 Animal welfare advocates and environmentalists are deeply saddened by the death of Sharmila, the fourth dolphin of Resorts World at Sentosa (RWS) to die, but are not surprised. On 12 May 2014, the Marine Life Park of RWS announced the death of Sharmila, a bottlenose dolphin trained in the Philippines and shipped to Singapore in 2012. In 2012, a male bottlenose dolphin, Wen-wen died en route to Singapore from the Philippines. A year before that, two dolphins died in Langkawi, Malaysia, where they were temporarily kept after being captured from the Solomon Islands for RWS. The park has yet to announce the cause of Sharmila’s death. In October 2012, environment and animal welfare groups filed a case to prevent the re-export of 25 dolphins trained in the Philippines for RWS. The groups claim that the dolphins were harvested unsustainably and this violates the Wildlife Act of the Philippines. The groups led by Earth Island Institute and the Philippine Animal Welfare Society urged the Philippine government to release all 25 animals back in the wild. “We were right to have filed a case. If they had been released by the Philippine authorities, they could have had a better chance at survival in the wild,” laments Anna Cabrera, Director of the Philippine Animal Welfare Society and co-petitioner in the case. ‘If RWS is truly for conservation and education, it should now immediately initiate a re-introduction program of the dolphins to the wild. It is the only way RWS can save its corporate image,” concludes Jamal Ashley Abbas, blogger and vocal animal rights advocate in the Philippines.